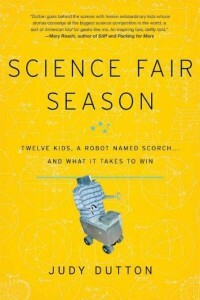 Science Fair Season: Twelve Kids, A Robot Named Scorch... and What it Takes to Win by Judy Dutton. Grades 7+ [adult, with high crossover appeal]. Hyperion, April 2011. 271 pages. Review copy provided by my local library. The Intel International Science and Engineering Fair is serious business. This science fair for high schoolers yields huge cash prizes and scholarships to the top young scientists from all over the world. But what does it take to win? Judy Dutton interviews eleven competitors with projects ranging from nuclear reactors to equine therapy programs to solar-powered heaters constructed from old car radiators and soda cans. Their stories will move and impress you - these are teens who are changing the face of science as we know it! I was very impressed with this book and I'm really hoping to see it on the Alex list this year. I think Judy Dutton gets the blend of personal information and scientific information exactly right. This will appeal to both teens and adults who have particular interest in science and teens/adults who love character-driven books. As I was reading, I felt like I knew each of these kids and I was rooting for them. The stories Ms. Dutton has chosen represent students from many different cultures and circumstances. For a lot of these kids, science fairs have given them the chance to turn their lives around. I'd highly recommend this title to anyone connected with science fairs and to teens and adults who have enjoyed books like The Freedom Writers Diary by Erin Gruwell or movies like Spellbound. Or to anyone who just wants to get inspired by the incredible work that teenagers around the world are doing!